Land area: 500.413 sq. kms. 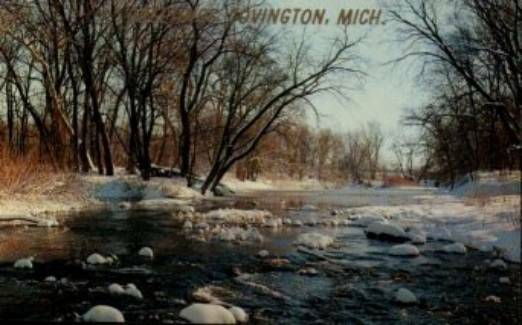 Covington MI is in the Eastern time zone (GMT -5). Situated at 46.32 N 88.33 W, East of Marqueate, South of L'Anse and Lake Superior, West of Nestoria, East of Sidnaw and North of Crystal Falls on U.S. Route 141. in Baraga County. Covington was founded by French-Canadians around 1885, and was named for the postmaster's home town of Covington, Kentucky. The community was a stop along the Duluth, South Shore & Atlantic Railroad Company that ran between Nestoria and Duluth, Minnesota. As the amount of forest land declined due to logging, farming became more prevalent. When a number of Finnish settlers started arriving in 1898, eventually outnumbering the small French and Swedish population, they planted fields of potatoes, corn, and wheat, and started pasturing milk cows. Others found work in the booming logging industry, buoyed by an abundant supply of cordwood and pulpwood. A temperance society Onnen Satama, meaning Harbor of Luck, was the first Finnish organization in Covington, and was organized on November 28, 1899. One year later, the Finnish Lutherans established the Covington Evangelical Lutheran Church. The church underwent a number of repairs and modifications over the ensuing years, but an altar painting offered to the church in 1931 by Professor Elmer A. Forsberg of the Chicago Art Institute resulted in the largest modification to date. Art Institute staff drew up plans to enlarge and remodel the church, which added the sanctuary, sacristy, and sexton's room. The interior was decorated in an Art Deco meets Finland style, with wood paneling, a candelabra, chandeliers, hand carved images of St. John and St. Peter, altar, and pulpit all designed by the Art Institute. In 1950 the church was renamed as the Bethany Evangelical Lutheran Church, and today is a tourist attraction while still having an active congregation. In the late 1920s, Covington was a planned along the proposed route US-102, one of the original U.S. Highways designated in Michigan. The route was originally planned to run north from Rapid River along the present day US-41, and then turn west at Marquette to end at Covington. After much disagreement, the final plan was to start the road near Crystal Falls and end in Covington. However, the road was decommissioned before it was even built, and the route was completely replaced by present-day US Highway 141. Nowadays, Covington is probably best known for its Finnish Music Festival, which is held around the Fourth of July every year and features musicians playing Finnish-inspired music on Finnish instruments. The daylong festival also features breakfast, church tours, and an all-day chicken barbecue. The community is also home to the UP Made Artist Market, a project of the non-profit Community Women's Group that is open from May to October. Along with crop and dairy farming, the lumber industry is still the largest source of income for residents today. However, increasing costs and decreasing prices have led many farmers to leave for the mining operations in Michigamme and Negaunee. Covington itself is a dispersed rural community in an area of Finnish farms and dairying. 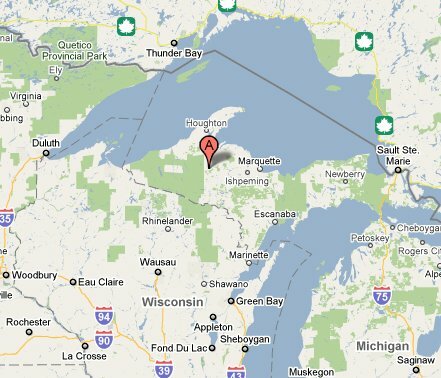 To Upper Peninsula visitors Covington is known as the place at important highway intersections, where U.S. 141 (to Crystal Falls) joins M-28 (to Ironwood and Duluth), just a few miles west of U.S. 41 between Marquette and the Keweenaw. The large family home and barn that's now the Covington Rest Home, a landmark on the north side of M-28, was built by local people who owned a big sawmill in lumbering days. The gas station at M-28 and U.S. 41 is also an attractive little restaurant. For many music lovers in the western and central Upper Peninsula, however, Covington means the day-long Covington Township Finnish Music Festival on one day of each Fourth of July weekend. Local volunteers put it on, and do many little things way better than usual. $7 buys an all-day button. The brats, for instance, and the homemade French fries. The festival attracts on the order of 2,000 visitors. Breakfast and church tours, both at the Bethany Lutheran Church on U.S. 141, are from 8 a.m. to 11 a.m. The church interior was decorated by a Chicago Art Institute faculty member many years ago. The style is sort of Art Deco with a Finnish rural populist touch. The nearby Covington Township Historical Museum is open. The music and the all-day chicken BBQ and food all take place in and near the big Covington Pavilion, paid for partly with music festival funds. It's on the south side of M-28, a little west of the U.S. 141 intersection. Most of the area's Finnish-influenced musicians play at the music festival. It has the mood of a reunion on a grand scale, with folks who can really dance. Also, free summer music concerts take place in the Pavilion. Check the new Covington web site, www.covingtonmichigan.com , for details of the concerts, the Finnish music festival, and other Covington-area events and institutions. Covington is far from the dying town it ought to be, thanks to the energy of an influx of young retirees who wanted to come back to their childhood homes. Dynamo Marge Kantola, married to a Covington native, herself hails from Detroit's large Finnish community and met her husband in the Motor City. Marge maintains that Covington has it all: a restaurant, the Hardwood Café where you can even get prime rib on Saturday night; a gas station (the café is in the gas station); a post office; a park; a community center; three healthy church congregations; a Head Start program; a museum; a recreation center (in winter the pavilion is flooded and becomes an ice rink, with a nearby tow rope and sledding hill); a community web site; a convenient general grocery four miles west (the Watton Country Store, formerly a co-operative store); wilderness, fishing, and camping a few miles away along the Sturgeon River in the Hiawatha National Forest; and a real sense of community and pride. (The Do Drop Inn has just closed, which is a loss.) Students are bussed to the big consolidated public school in L'Anse. One envious observer from L'Anse says it actually helps that Covington has only one retail business because it reduces destructive rivalries. To be a living community, Covington people know they have to work together. The interesting Covington Township Historical Museum is on a side street off U.S. 141. Turn at the abandoned corner store. Tacked to the museum door is a list of phone numbers of people willing to open the museum on short notice. The museum is in the former community building and movie theater. Many displays offer insights on Finnish-American rural life just after World War II, before the young people had left for the cities. Each year, when the DNR sends a helicopter out to locate moose before netting, collaring, and tagging them, huge numbers of moose are seen in the wetlands along Tracey Creek east of U.S. 141. Be prepared to go back in on rough logging roads, and take a compass! Plan your trip for the few hours after dawn or before dusk.